Note: Pathfinder Campaign Setting: The Inner Sea World Guide has replaced this volume as the main Pathfinder campaign setting book. The newer volume has been expanded and updated, and is designed for use with the Pathfinder Roleplaying Game. And the PDF is cheaper, too! Golarion, the exciting world of the Pathfinder Adventure Paths and Pathfinder Modules, comes alive in this massive 256-page full-color hardcover tome primed up and ready to go for your new campaign! Detailed sections on more than 40 nations—from the frontiers of Varisia to the devil-tainted cities of Cheliax to the frigid Hold of the Mammoth Lords—provide a full picture of the world of the Pathfinder Chronicles campaign setting, with new rules, new magic and spells, detailed descriptions of more than twenty gods and their religions, and a gorgeous poster map detailing the entire campaign setting. 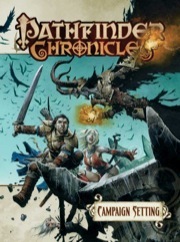 The Pathfinder Chronicles campaign setting provides classic adventuring style and cutting-edge game design perfectly suitable for the world’s most popular roleplaying game! An excellent, if slightly flawed resource! A lot of this review is going to be negative, so let me start out by saying, I love this world, and this is an excellent source book. I'm nit-picking because I feel there's so much to improve, but where they started is amazing. Also worth note before I get started: there is a new version coming out sometime in early 2011, so if you can get this book at cover price, it's probably still worth it, but some of the crazy prices I've seen at 2-5 times the cover price are definitely not worth paying. The new version will be an update to the latest Pathfinder rules (this edition is just OGL-compatible), which means you can expect the sections about character classes to change, but that's probably about it. There's not much "crunch" in this book, as one might expect, and so a rules update is kind of tangential to its content. There is also a book about the Inner Sea region coming out (Pathfinder Campaign Setting World Guide: The Inner Sea (Revised Edition)), so if you are specifically interested in that region, you might want to go that route either alone or in addition. Now to the review. The cover art is blurry. An odd defect, given Paizo's usual standards, but I'll assume this is an artifact of their early rush to print when they were just getting started in the post-Dragon/Dungeon magazines era. Inside, the book is beautiful. The art is spot-on and really gives a sense of the world. The poster map that comes with the book is excellent, if somewhat more sparse on detail than I would have expected. The races are wonderful. I especially love what they've done with gnomes: a race I previously couldn't care less about is now one of my favorites! However, as you start to read, you definitely get the sense that someone forgot to write the introduction chapter. You end up having to essentially read the entire book cover-to-cover in order to make sense of the world. An intro that told us, "This is Golarion. Most of the action will take place in or within 1000 miles of the Inner Sea, a temperate sea that acts as the divide between the two major continents...." and so on. Not an in-depth view of the countries and peoples. There's plenty of that later on, but just a quick intro so that I don't feel lost the first time a major country or god's name is dropped as if I'm supposed to know what it means. I actually bought this book because the Adventure Paths were giving me the same lost feeling, and it solved that problem, but only after I slogged through most of the book (starting with the History chapter helped a bit). In the writeups of the races, I have roughly the same problem. You almost have to start reading them from the middle, because that's usually where they get around to explaining who and what they are, rather than how they found themselves in some historical calamity, but again these write-ups are brilliant. Gnomes are much improved over their D&D roots, but every race has some excellent flavor to it. Elves will definitely be interesting. They're not really very nice, and I like that about them. In fact, between the Elves and the Drow, it's actually hard to choose a group to support, but the Drow have a point in feeling abandoned and wronged by the other elves. Humans are my favorite race, however. I love the fact that they're not just the everyman white, European analog with a few ethnic minorities thrown in for flavor that most fantasy games have. They're a diverse mix of humanity both fantastic and realistic, and the Inner Sea is ideally located to be a mixing pot of Arabesque and pseudo-Eruopean influences of many flavors. Overall, this is an excellent resource. If you're looking for a fully realized world on which to base a campaign, this is definitely it. If you're looking for a quick reference, then I suggest picking up the smaller Chronicles books such as Gods & Magic and Guide to Absalom that suit your needs. 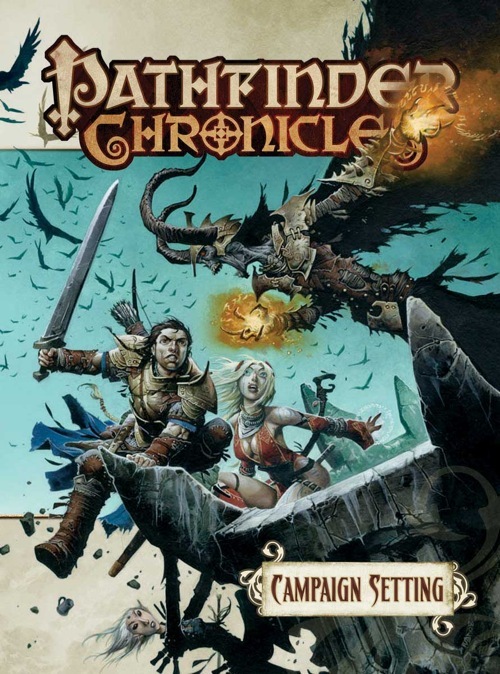 Extremely well written campaign setting, as stated mostly exposition of setting materials with few actual rules additions (it is a campaign setting book after all). Richly detailed, excellent take on many of the standars of the genre. An amazingly well written campaign setting. The book is mostly fluff, but the crunch is very well written, evocative, and balanced, while the fluff draws on some of the best fantasy concepts and giving them a fresh spin. I definitely recommend this title. Is this available now? Is there a PDF with it? You only get a free PDF with it as part of a Pathfinder Chronicles subscription, but if you want to pay extra, you can get it once the book hits stores. How if at all is this Campaign Setting going to be affected by the release of the Pathfinder RPG rules next year? Will an update to the CS come out with rules changes to match the Pathfinder RPG rules set? Any chance of us getting that stuff in a PDF after release of the PFRPG? Uhh.... ask again in a year. Just got mine in the mail a day or two ago. Awesome! I'm a bit bleary-eyed here at work, since I stayed up WAAAAAY past my bedtime reading this masterpiece. BIG QUESTION: When will the PDF be available in the Paizo Store? Didn't see this question posted so here goes. For Mike McArtor, Erik Mona, or F. Wesley, what is the scale of the small maps of the regions inside the section detailing those? For example, Cheliax and Taldor. I just checked Amazon and they say this book comes out in Sept 2008 and is currently available for PRE-ORDER. So, to everyone that has actually picked this up, have any of you actually purchased it from Amazon or has everyone gotten it directly from Paizo? The stable of writers… well, I'm sure it seemed like a good idea at the time. But I came to Paizo to get away from Ye Olde Passive Voice Duffers Patrol, luminaries of which august body pepper the credits page like deposits of mouse excreta upon the family silver. Uhh... you do realize that Paizo aims a lot of its products at people who like the stuff written by the Old Guard, right? "Grognards," as they are sometimes called. ... you do realize that Paizo aims a lot of its products at people who like the stuff written by the Old Guard, right? "Grognards," as they are sometimes called. I would be one of those to whom Paizo successfully caters. Okay, but then there's me & mine - the Young-Punk Rabble-Rouser Skateboard-&-Switchblade Regiment, ourselves contributing quite a bit to the book as well. And it's edited like a DREAM. My guess is that the discerning RPG connoisseur will be both well-pleased and well-served by the book, specifically by the unique admixture represented in the combination of Veteran Guards with Aspiring Champions. If you are into that, have a look here! Let's just say that Paizo's style isn't locked into one demographic of taste and play style. If they can snag onto the old-school renaissance crowd and get me hooked at the same time, they're doing something right. There are a lot of people on that list much, much more "old guardy" than I am. And none of them are caught dead in passive voice if they can help it. Honestly, the direction I got for my small, humble section meant I wrote something very different that I have ever written for anyone else. I suspect the Paizo staff knows how to match writer to section well enough to keep their great fans very, very happy. If I pick this up at GenCon, do I still get the PDF? What about any other Pathfinder materials (modules, etc.) that I pick up at GenCon? Is it possible for me to get pdf downloads without purchasing the physical book online? I am planning to run society events scheduled through our store here, but will be managing the process personally, as we lack the space to run them on site! If you can pick out which sections were written by the Old Guard vs. which sections were written by the umm... Not-Old Guard, then I won't argue with you. But I would bet that you couldn't do it. G@%$+#n young punks! Always with the insults! Get offa my lawn! I jusyt got this in the mail... and I'm in love. Good point. In talking about writing stuff, I've had the good fortune or providential blessing to find opportunities offered that are good fits with my strengths, such as they may be. I wonder if I'm Old Guardy. I feel old compared to in D&D years, but in terms of being a "writer of D&D stuff" I've only been doing that since like 2002. I wonder how you qualify for olde guardiness? Did you use the passive voice here on purpose? You can purchase pdfs for any product online. Free pdfs are an added bonus for subscribers, and any product that ships to you as part of a Pathfinder sub grants access to the pdf. Otherwise, they are a separate product which must be purchased individually. I think he means "it doesn't feel like it was written by a bunch of different authors, it's one cohesive whole." and not, "there's no way you'd think this book was written by Talented and Excellent writers after I got through with it." ACK! Yes. I'm going to edit my post now. there is maybe one sentence per 'article' that you can read and go "that sounds like X's writing" the rest reads and sounds like a compilation of various voices. I was wondering, just how much crossover there is between this book and the Gazzeteer? I am interested in picking both up, but the budget is way too tight to justify picking both up if the amount of shared info is too great. From what I have seen and heard so far, Paizo is not in the habit of gouging their customers by publishing two books of similar material, but need to know in order to justify the expense to "higher"
The PDF version doesn't go up for sale until the book hits retail shelves, which is usually a couple weeks or so after it ships to subscribers. In this case, I think I remember Vic stating that the PDF was going to be available on August 14th (I think). EDIT. I checked on the other thread and yes, it's August 14th. The crossover between those two books is pretty mighty. Think of the Gaz as the Hardcover Lite. The picture on page 52, the first page of the Inner Sea chapter... is that the Arch of Aroden? Has the CS book gone out to retailers yet? My FLGS has it in their computer but no release date is posted. Will it be possible to find on the shelves later this week? I try to keep my purchases to the FLGS (with the exception of my AP sub). We've shipped to distributors; hopefully they've shipped to retailers. The street date is August 14.
mine showed up today. VERY nice work, guys! Just having skimmed the book at a friend's place, I can't say much. It looks great, and the new classes I think make it a brilliant resource for players and not just DMs. I wonder if those classes will also be included in the new Pathfinder RPG????? Any info available yet???? I'm surprised the map locations in Appendix A top out at August 2008, meaning the book will be out of date in a month or so. Aren't the Pathfinder APs known at least 4 to 6 months in advance of their release month? It would have been nice if the book had been published with the PAP locations through to early 2009 or so. As it is now, it seems like just a sort of advertising blurb disguised as something more useful. Looking at it a year from now will be odd, showing adventure locations from the distant past. Of course anything that talks about other products is going to be out of date in a month. There's nothing we could have done about that. If the gang is feeling spunky and finally invented that 25th hour in the day, they might periodically go in and update the PDF of those pages, but I wouldn't ask them to do that and nor would I hold my breath. Well...This evening I made a few phone calls. Barnes&Noble, Borders, Walden and the FLGS. They all have them in their computer but no clue as to when they are going to get them. B&N's website says August 24th though. Grrrr. Paizo knows where at least the next 8 PAPs will be located on the map of Golarion. It wouldn't have taken an extra hour to the day to add them to the map as well. That is all I'm trying to say. It would have been nice for the map in the book to show all the PAPs instead of just those already published. It would have made the book seem 'fresher' until well into 2009.